Given the testimony from last week’s action in a Georgia courtroom, Obama has a lot of explaining to do. His attorney, Michael Jablonski, was a NO SHOW as was Obama, who instead opted to shake hands and empty donors’ wallets in Las Vegas. The case revolves around the Natural Born clause of the Constitution and whether or not Obama qualifies under it to serve. 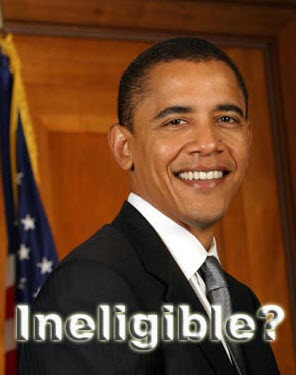 More to the point, if found ineligible, Obama’s name will not appear on the 2012 ballot in Georgia. Carl Swensson gave us the details of what happened this evening on my radio program. The American People Are Rising Up. Citizens In Six States Are Now DEMANDING That Barack Obama’s Name Be Stripped From The Ballot Unless He Can Prove That He Is Eligible To Hold The Office He Usurped In 2008! We’ll take Collins’ assertion a step further: it doesn’t even matter if Judge Malihi rules in favor of patriotic Americans or not. Team Obama is already devastated! The dominoes are already falling! The floodgates are wide open. Our cause has new life. Citizens are rising up in other states and now that we have the momentum, we must press our advantage and keep striking while the iron is hot. We must strike until ALL THE DOMINOES have fallen and we must send an avalanche of faxes to the Secretaries of State of ALL 50 States and our elected officials in Congress. Our message is simple but potent: Make Barack Hussein Obama PROVE that he is eligible to run for President of the United States or STRIKE HIS NAME FROM THE BALLOT. Put The Secretaries Of State In ALL 50 States On Notice: Make Obama Prove That He Is Eligible To Hold The Office He Usurped Or Take Him Off The Ballot! But when he agreed to hear the case, Judge Malihi changed the rules of the game. Simply put, up until now, judges have played “hot potato” with the eligibility issue. Although Team Obama has falsely stated that judges have ruled in Obama’s favor on the eligibility issue, the TRUTH is that in every single instance, Team Obama filed motions to dismiss these cases on purely procedural grounds and judges have gone along and used these motions as an excuse to AVOID EVEN HEARING THESE CASES in the first place. Make no mistake, when Judge Malihi agreed to actually hear the case last week, he DROPPED A HUGE BOMB and permanently changed the dynamic of the debate. In essence, he VALIDATED that judges have the duty to hear these cases and he validated that the Georgia Secretary of State (and the Secretaries of State of the remaining 49 states for that matter) can’t hide behind pathetic excuses. They simply can’t “rubber stamp” candidate certifications, as they did in 2008. And that’s why we MUST put the Secretaries of State of ALL 50 states and our leaders in Congress on notice. The man behind the curtain is now exposed. They have no more excuses. No matter what happens in Georgia, Malihi’s ruling is a HUGE VICTORY. The Secretaries of State of all 50 states can no longer DENY that they have a SOLEMN DUTY to ensure that Barack Hussein Obama is eligible to seek the office of President of the United States! And it is vitally important that they know that you know it as well… and that you will be watching them! Will Hawaii Finally Be Forced To Bring Barack Obama’s Actual Birth Certificate Out Of Hiding? It could happen. While the mainstream media has remained silent on the issue, Team Obama may have made a significant and game-changing mistake. In plain English, Taitz now has legal grounds to DEMAND Obama’s actual birth certificate (if one even exists) that is presently under lock and key in some damp and dusty room in Hawaii. But as you already know, what is actually legal and proper is not relevant to Team Obama and the scores of elected officials in Washington and across the country who simply enable his evasions. Patriotic Americans must bring pressure to bear to get at the truth. P.S. It’s been a long fight. It’s been a hard fight. But finally, we are close to getting answers and accountability from the Usurper-In-Chief, Barack Hussein Obama. But nothing will happen unless we bring pressure to bear. Join us and put the Secretaries of State of all 50 states (and our leaders in Congress) on notice: Make Barack Hussein Obama prove that he is eligible to hold the office he usurped or take him off the ballot!